Breast milk substitute. For combination & bottle-fed babies. Nutritionally complete and enriched with Omega 3 & 6 LCPs and GOS/FOS. Leading baby nutrition research for over 100 years. Suitable for Halal. Stage 1, from birth Breast milk substitute Same formula, fresh new design Leading baby nutrition research for over 100 years SMA® PRO First Infant Milk, our best alternative to breast milk, when baby is not breastfed. Breastfeeding provides the best start for your baby, but if you decide to combination feed or bottle-feed then SMA® PRO First Infant Milk is a nutritionally complete breast milk substitute, enriched with Omega 3 & 6 LCPs and GOS/FOS?. ?GOS/FOS = Galacto-oligosaccharides/ Fructo-oligosaccharides Also available in resealable ready-to-feed liquids. Ready-to-feed liquids do not require any preparation. Just shake and pour them straight into a sterilised bottle. Available in 1 litre and 200 ml on-the-go resealable cartons. Starter pack also available containing 6 x SMA® PRO First Infant Milk 70 ml plastic bottles with 6 x NUK pre-sterilised orthodontic teats. Moving to the next stage? 6 months + SMA® PRO Follow-on Milk is tailored for babies from 6 months as part of a varied weaning diet. At 6 months, your baby's development progresses quickly and their need for iron increases. 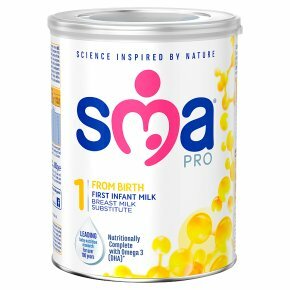 SMA® PRO Follow-on Milk is enriched with iron to help support normal cognitive development in baby's brain. It also contains a blend of vitamins, including A, C & D to help support the normal function of baby's immune system, and is enriched with Omega 3 & 6? and iodine to help support normal growth. ? The beneficial effect of essential fatty acids is obtained with a daily intake of 10 g of Linoleic acid and 2 g of a-linolenic acid. IMPORTANT NOTICE: Breast milk is best for babies and breastfeeding should continue for as long as possible. Infant milks are suitable from birth when babies are not breastfed and should only be used on the advice of a doctor, midwife, health visitor, public health nurse, dietitian or pharmacist, or other professionals responsible for maternal and child care. When bottle-feeding, do not allow prolonged or frequent contact of milk feeds with teeth as this increases the risk of tooth decay. Ask your healthcare professional or dentist for advice. Always hold your baby while feeding. Do not leave baby unattended as they might choke.